CytoSport, Inc., one of leading sports nutrition companies and maker of MUSCLE MILK® premium protein products, will feature seven college athletic programs on custom, limited edition 14 ounce packaging to celebrate the start of college football season. Partner programs include the Alabama Crimson Tide, Arizona State Sun Devils, Oregon Ducks, Syracuse Orange, Tennessee Volunteers, Texas A&M Aggies and the Texas Longhorns. These limited edition collegiate themed bottles are branded with individual athletic program logos, colors and graphics, and are available at retail outlets in local and regional markets through the end of the year. 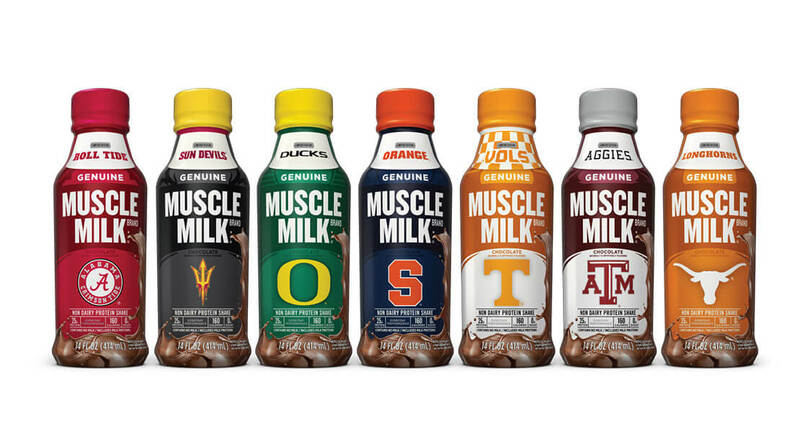 The MUSCLE MILK® brand touts official partnerships with 28 Division 1 athletic departments and provides product support to more than 400 colleges and universities around the country.